This post is about fixing a problem with the screen brightness adjustment. 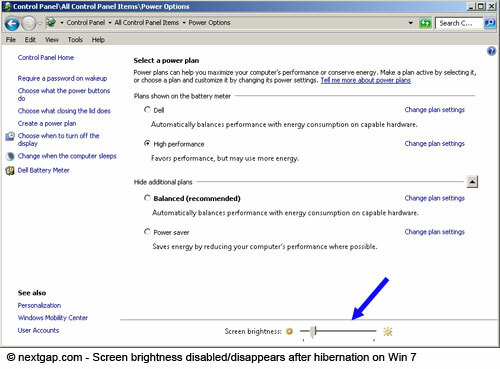 On Win7, hibernation causes the screen brightness adjustment to not function, thus, staying stuck in the last brightness set. Using the keyboard brightnes key’s doesn’t do a thing. Also going directly via the control panel > power options doesn’t help. In the later, the option just disappears (!) after hibernation. I found a hotfix to that problem in Microsoft support. All you need to do is download the hotfix and install it, and problem (at least on my Win7 machine) will be solved.